This is from the Fall 2013 version of the course. For the most recent version, try http://rust-class.org/pages/virtualbox.html. VirtualBox is a virtualization tool that allows you to run a guest operating system on a host operating system. The guest operating system interacts with a virtual machine, that is implemented running on the host operating system and simulates the physical hardware the guest operating system expects to run on (in this case, an x86 or AMD64 processor and other hardware devices). Later in the course, we'll talk about virtualization techniques. Note: You are not required to use VirtualBox. If you prefer to set up your own native working environment that is fine and will have big performance advantages, but if you run into troubles with things not behaving as expected, the course staff is unlikely to be able to help you unless you are using the standard environment. This step is for Mac OS X and Linux only! Run VirtualBox and set up a host-only network by selecting VirtualBox | Preferences (or VirtualBox | File | Preferences on Linux) to open the Preferences dialog. Select the Network tab and click the + icon to "Add host-only network (lns)". You should see a network vboxnet0 added to the list of networks. Click OK.
Download the cs4414 image: cs4414-ubuntu-12.04.2-32bit-vdi.zip. The file is 1.5GB so go get a coffee (even decaf should work fine for this, although it has not been tested by the course staff). Save the file wherever you want to do your work for this course. Extract it (for most systems this should happen automatically when you double-click it, if not, use unzip cs4414-ubuntu-12.04.2-32bit-vdi.zip). (Be patient, this will also take a few minutes.) This will create the cs4414-ubuntu-12.04.2-32bit-vdi subdirectory wherever you do the extraction. 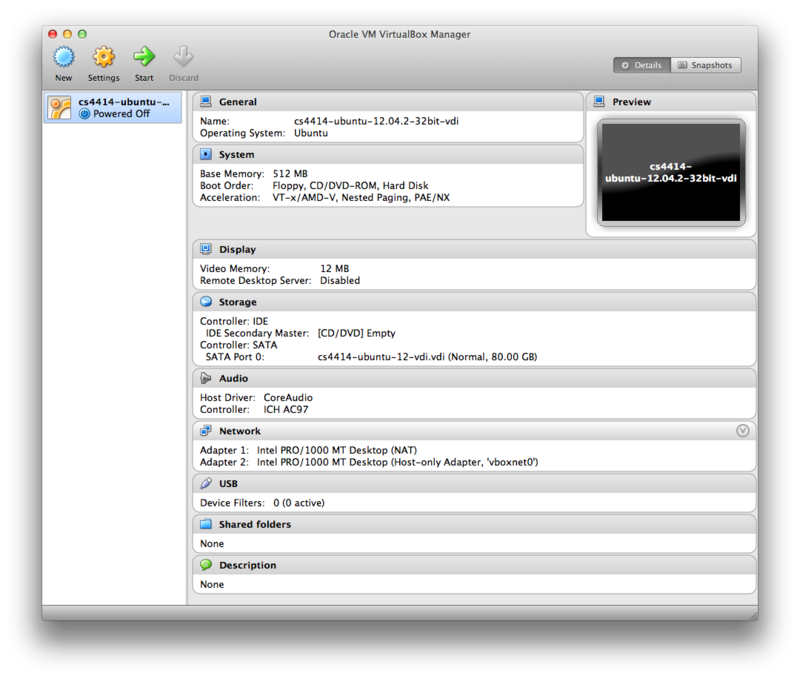 Start a new VM (click Start) using this image. You might (or might not) get a few dialogs from VirtualBox about input capture, and then will see a window running Ubuntu. You are now running Ubuntu on a virtual machine. Try running some programs in the VM. You should be able to browse external web sites using Firefox or Chrome, and start a shell using the Terminal.